We have continued our work with Warwick District Council - providing assistance in their challenging land allocation process. There is great pressure for new development sites throughout the district. We have reviewed more than 20 sites of between 5 and 300 hectares - providing preliminary analysis of landscape and visual impact, assessing suitability in terms of other planning and landscape policy and identifying potential for green infrastructure benefits and impact mitigation. 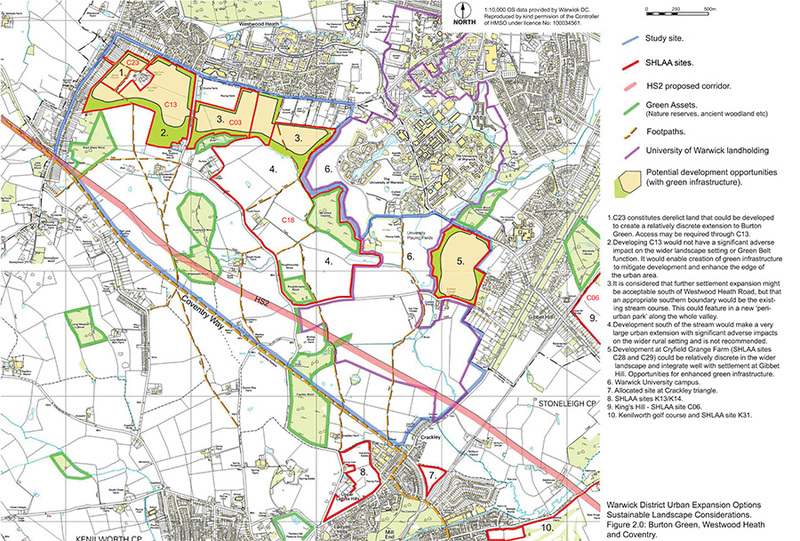 Part of our assessment of potential sites for strategic development allocation south of Coventry. Incorporated as Richard Morrish Associates Ltd. Company No. 4924536. Registered Office: 56 Common Lane, North Runcton, King's Lynn, PE33 0RF.